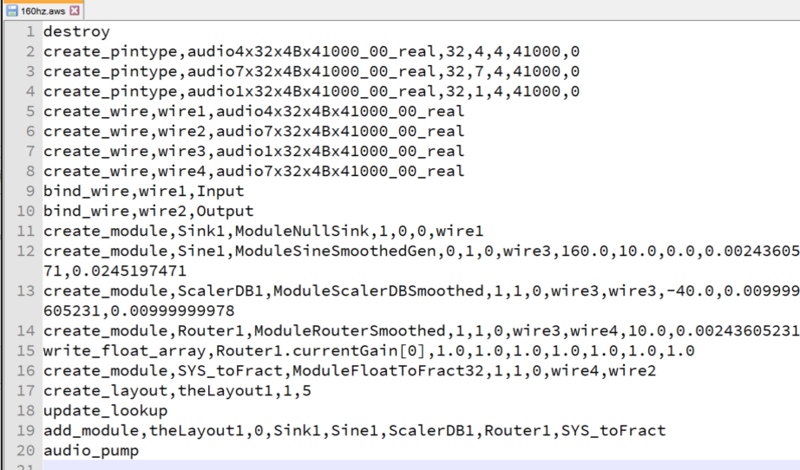 ​Optimized audio processing, wherever your software runs. 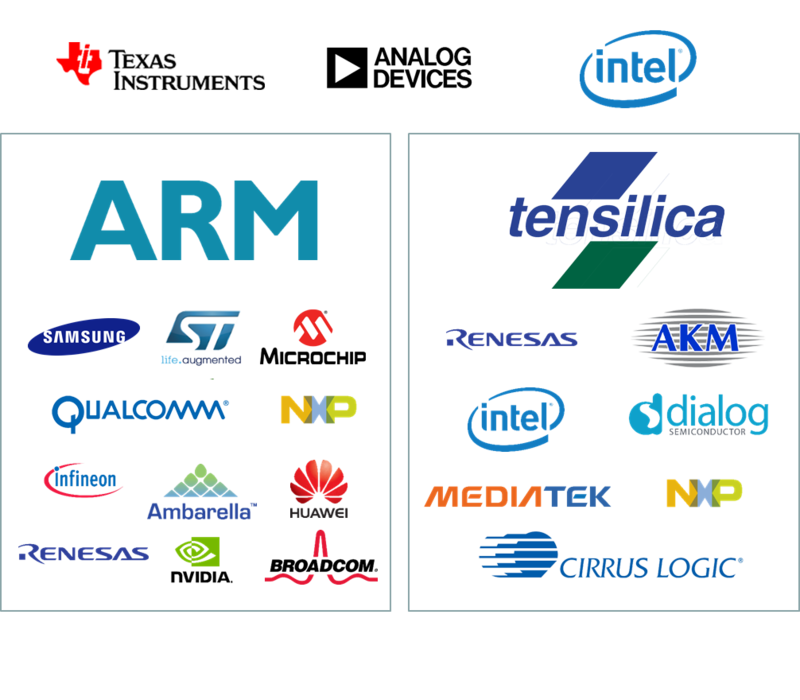 The AWE Core™ is an audio-processing engine that's hand-optimized for all of today's most popular embedded processors. It's delivered either as a library or a Linux executable, allowing you to easily add digital-audio processing to virtually any embedded product. Embedded applications interact with the AWE core™ by exchanging three types of data: Audio Data, Tuning Data, and Control Data, each with their own API. Audio Data is simply blocks of audio samples, Tuning data is configuration data from Audio Weaver® Designer, and Control data is typically HMI-input and status-data output from the audio-processing, such as current RMS level or event-detection flags. For further detail, see the AWE Core™ Integration Guide. The AWE Core™ is a data-driven machine that self-configures based on a set of commands; these "Tuning Commands" define a signal processing Layout, including both the module topology and initial tuning. During design-time, the AWE Core™ receives these commands in real-time from Audio Weaver® Designer over a tuning interface such as USB or RS-232. After final tuning is complete, the "production" command set is exported and saved in your product, where it's fed to the AWE Core™ at boot-time. The AWE Core™ comes with a full suite of audio-processing modules that supports the full spectrum of audio processing needs, from hyper-efficient IoT devices to ultra-premium automotive systems. 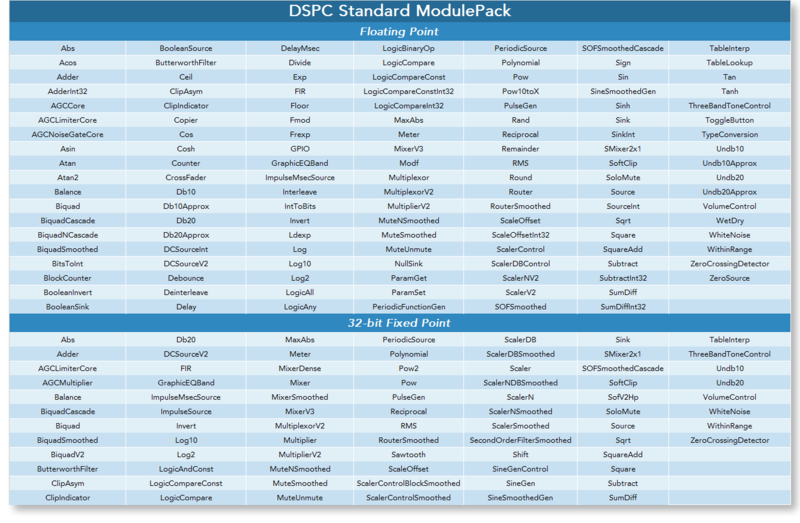 The Audio Weaver® Modules are packaged into two ModulePacks: The DSPC Standard ModulePack™, which includes everything needed for most two-channel systems, including Filters, Scalers, Limiters, Signal Generators, etc; and the DSPC Advanced ModulePack™, which expands the palette to enable Frequency-domain processing, multi-rate processing, complex math, high-precision filters, and more! 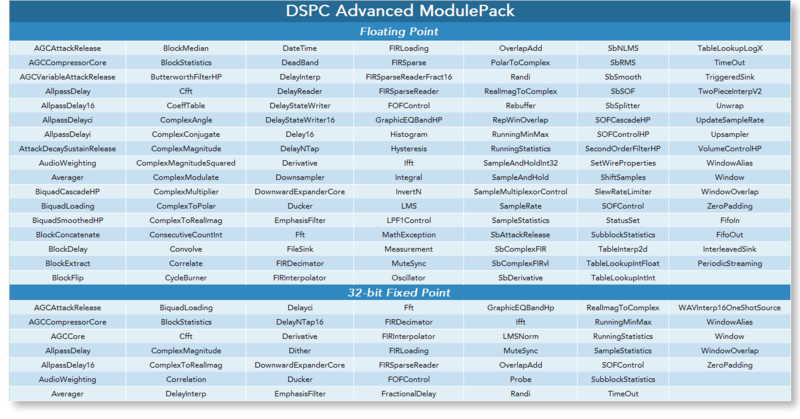 In addition to the included Audio Modules above, DSP Concepts offers a Custom Module SDK. While the Standard and Advanced ModulePacks allow for nearly any Audio system to be realized in the AWE Core™, the Custom Module SDK allows customers to wrap their own IP as Audio Weaver® Modules. Note: Matlab™ (R2014b or greater) and the Pro Edition of Audio Weaver® Designer are required to use the DSPC Custom Module SDK. DSP Concepts provides example Board Support Packages ("BSPs") with the AWE Core™ fully integrated and working. These can be used either as reference to see the API's in action, or as starting points for your design. As references, they're provided as supplementary material to the AWE Core™ - Integration Guide. The AWE Core™ is licensed on a per-unit royalty basis, with price-breaks as volumes scale up. Any licensing of the AWE Core™ includes one free seat of Audio Weaver® Designer Standard Edition. (Additional seats of Audio Weaver® Designer are offered on an annual, per-seat subscription basis.) To get pricing info for your team and project, please contact us below!